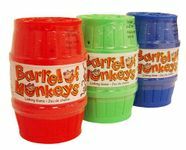 Standard plastic barrel edition, in red, green, blue or yellow. Comes with 12 2&1/2" red monkeys. Most common, currently available design.